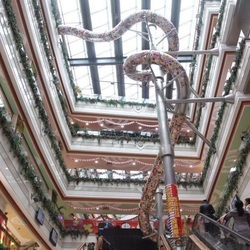 A five-storey high, giant, winding slide has been completed inside the Paris Spring shopping mall in Pudong New Area, Shanghai. ​With multiple curves, the slide, made of stainless steel and shaped like a dragon, is expected to open after the Lantern Festival on February 22. Photos taken by shoppers have been released online and attracted widespread interest and attention, causing heated discussion and concern over safety issues.